Low Mileage, Sunroof, Leather Seats, Heated Seats, Rear View Camera, Premium Sound Package ! On sale now! This vehicle was originally listed at $31895. We've marked it down to $29895. You save $2000. This 2011 BMW 7 Series is exceptionally comfortable for rear seat passengers, having one of the most comfortable seating positions in the class. 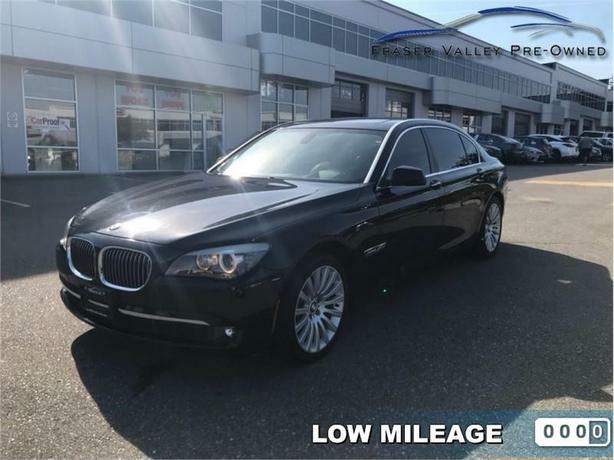 This 2011 BMW 7 Series is for sale today in Abbotsford. Recently redesigned inside and out, this BMW 7-Series delivers ultimate-driving-machine performance, despite its size and heft. It also has the best rear seating position in its class, delivering nothing but comfort and luxury. BMW have created the quintessential sedan with this 7 Series, fitting it nothing but the best in luxury and high grade quality components.This low mileage sedan has just 69163 kms. It's blacksapphire in colour. It has a 6 speed auto transmission and is powered by a 400HP 4.4L 8 Cylinder Engine. This vehicle has been upgraded with the following features: Sunroof, Leather Seats, Heated Seats, Rear View Camera, Premium Sound Package . Our 7 Series's trim level is 750Li xDrive. Our 750Li xDrive offers better style and looks for this year. Packed features include a rear view camera, tire pressure monitoring, daytime running lights, adaptive headlights, xenon HID headlamps with auto-delay off, stylish aluminum alloy wheels, power glass sunroof,four-zone climate control, leather steering wheel with audio controls, front/rear parking sensors, premium leather front bucket seats and a lot more! This car is cool! Buy this vehicle now for the lowest bi-weekly payment of $264.47 with $0 down for 60 months @ 5.69% APR O.A.C. ( Plus applicable taxes - Plus applicable fees ). See dealer for details.